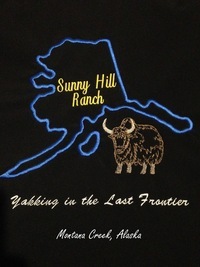 Sunny Hill Ranch: Why Yak? Home Sunny Hill Ranch: Why Yak? The question on everyone’s mind always seems to be, “Why yak?" Yaks are ideal livestock since they are uniquely suited for the long cold harsh winters in the Upper Susitna Valley. Efficient browsers and grazers, yaks are exceedingly hardy while only needing to eat roughly 1/3 of what beef cattle do. Yaks also come with a variety of uniquely fun and engaging personalities. In one short word….they are “fun!" Yaks also have a variety of uses, like meat, fiber, packing, and as pets. Yak meat is similar in flavor to lean, high quality grass fed beef. It is milder, though, having a cleaner finish on the palate. Yaks develop their fat layer externally, without the marbling found in beef.